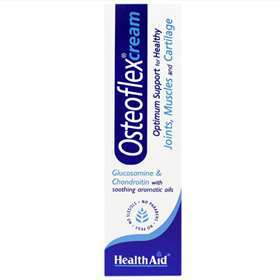 HealthAid Osteoflex Cream provides optimum support for joints, muscles and cartilage. This cream contains a combination of high grade Glucosamine and Chrondrotin Sulphate with added soothing aromatic oils and menthol to help maintain supple, flexible joints, and strong cartilage. Soothing aromatic oils and menthol. Free from Glycols, SLES/SLS, Parabens, TEA, PEG's, Artificial Colours and Fragrance. Also available Osteoflex prolonged release 30 tablets. Adults and children over 6 years of age, apply sparingly to affected area and gently massage into the skin until fully absorbed. Use 2-3 times daily. Avoid contact with eyes. If this occurs, rinse thoroughly with clean warm water. Discontinue if irritation or redness of skin develops. Store in a cool dry place away from direct sunlight; out of sight and reach of children. Aqua, Cetearyl Alcohol, Methyl Salicylate, Eucalyptus Globulus Leaf Oil, Menthol, Stearic Acid, Glyceryl Stearate, Prunus Amygdalus Dulcis Oil, Helianthus Annuus Seed Oil, Phenoxyethanol, Sodium Chondrotin Sulfate, Glucosamine HCL, Sodium Lauryl Sulfoacetate, Ethylhexyl Glycerin, Sodium Hydroxide, Limonene.